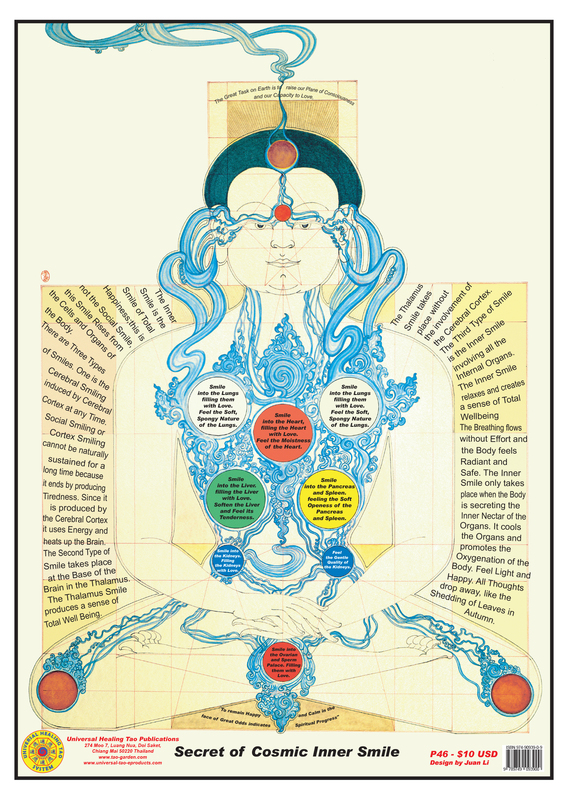 This poster illustrates the Male Body Cosmic Inner Smile with the Virtue Energies of the Five Vital Organs, beautifully illustrated by Universal Healing Tao Senior Instructor Juan Li's original meditative art drawings. By using the autonomic nervous system internally through your eyes with a parasympathetic (positive) response you create a good feeling of love in your body. Your heart generates this smiling energy when you focus your eyes into your heart with positive thoughts. When you smile down your body, your body will respond with positive loving energy. This is how we learn to generate love within ourselves instead taking it from others; the abundance of that love within us will spread to others energetically across time and space without trying to give love to anyone.